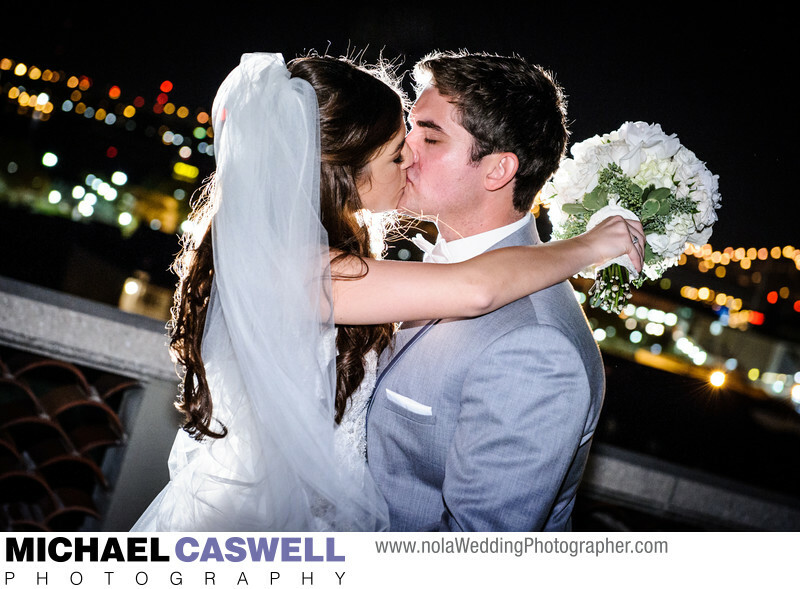 The Omni Royal Orleans Hotel's rooftop observation deck is a favorite spot to sneak away to during a wedding reception being held there. It's practically mandatory! Whether daytime or night, a beautiful background of the New Orleans skyline and the bridge can be seen from here. In this photograph, I backlit the couple with a small flash to create that glowing separation effect that helps them stand out from the background and gives the image a nice bit of pop. This centrally-located French Quarter hotel is well-equipped for hosting a wedding of just about any size, whether it be just a reception or a ceremony as well. The main Grand Salon ballroom is used for larger weddings, while the Esplanade Room and Royal Garden Terrace are great for smaller events, with the latter being located adjacent to the hotel's spacious courtyard. While the observation deck will often have guests present, relaxing and enjoying the view themselves, they will in almost all cases graciously move aside for the newly married bride and groom's photo shoot. Location: 621 St. Louis Street, New Orleans, LA 70130.